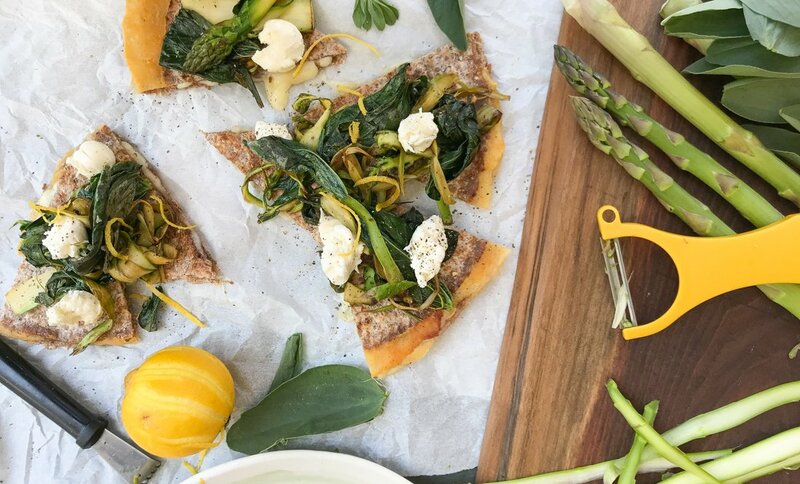 This “quesadilla pizza” marries health & the flavors of Spring. It is a great little make-in-mere-minutes snack that feeds you (with the veggies) & the little ones (with plain quesadilla) at the same time! Get the quesadilla going the normal way: scatter the top of one tortilla with cheese, cover with another tortilla and heat in a dry skillet, turning occasionally until the cheese has melted and the tortillas are browned. Meanwhile, in another skillet, heat a tablespoon of olive oil and add the asparagus and greens. Cook until just done and season with salt. Plop the quesadilla on a cutting board and cut into pie slices. Arrange the veggies on top, and add mozzarella, lemon curls, and pepper.